Hundreds of tons of garbage, that include plastic materials, are being scavenged in the whole city every day. 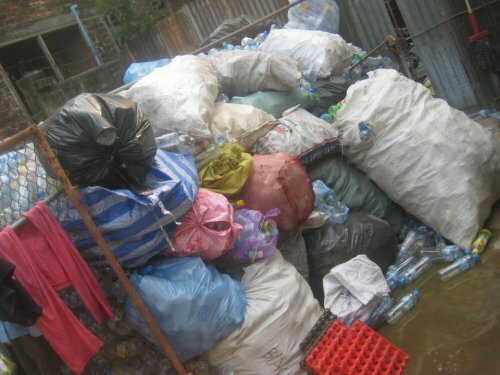 And these include refuse from the riverside Chao Anouvong Park which is frequented by local and foreign tourists. While Vientiane remains as one of the most relaxed capitals in the world, there is now a growing concern over the impact of plastic wastes on the environment and on the country’s 7 million people. This concern is not limited to Laos but throughout the world. A report released earlier this year estimated that more than 9 million metric tons of plastics and related refuse of all conceivable shapes and sizes had been found already in oceans worldwide. It’s an alarming figure and one that continues to rise at a rapid rate, spurring global efforts to address the problem. The report identified emerging economies of Asia as key sources of plastic wastes that enter the world’s rivers and seas, both concentrated and dispersed by ocean currents. Of course for the newly-empowered consumers (particularly in a landlocked country like Laos), there is a universal nonchalance as to the ultimate effect of their buying habits to the more distant matters of oceanic biodiversity and marine ecosystem. Yet with the negative impacts of inappropriate disposal on public health and the air and water closer to home, it is certainly an issue increasingly on the radar. The growing size and scale of consumption and the disposal of waste products that include toxic materials from industries have posed the greatest challenge to the world’s biodiversity and ecological balance. For example, in Laos only an estimated 46,000 tons of hazardous waste created per year are disposed of properly, according to official estimates from Lao Ministry of Industry and Commerce. Indeed, wastes, including old engine oil, discarded batteries and electronic items usually end up in landfills or in other areas near population centers. Policymakers are increasingly frank in the assessment about the scale of these challenges, with much of the country still not being served by household waste collection services. Indeed it is this challenge that is bringing together city authorities, academic experts and students of the country’s National University of Laos (NUOL) together to find innovative solutions to the problem. NUOL Dean Associate Professor Somchith Souksavath and Vice-Dean Phouphet Kyophilavong and representatives from Vientiane Urban Development Administration Authority (VUDAA) have come together to chart a more sustainable waste disposal system. Cleaning and greening the city has been given extra impetus with the upcoming 40th anniversary celebrations to mark the establishment of the Lao People’s Democratic Republic set for December. To achieve this goal, the government has tapped the expertise of private organizations within the country and from abroad, including the non-governmental organization Green Vientiane. Green Vientiane’s signature recyclable bags are now being sold in downtown cafes and markets, a welcome development that would contribute to the success of the drive to clean up the environment. But there is much to be done and Green Vientiane Director Serge Doussantousse is not under any illusion that the use of recyclable bags could solve the problem once and for all. He said there a need to create awareness among the Laotian people and for them to change their habits, particularly in disposing of their waste materials. Serge said that even the customary burning of garbage is harmful to the environment since this would contribute to global warming and climate change. As part of their campaign, the Green Vientiane has released a 10-minute educational video, entitled “ From Banana Leaves to Plastic Bags,” that depicts the hazards of using plastics instead of the traditional banana leaves in wrapping food products. According to Serge, the venerated position held by monks in the society of the primarily Buddhist nation and the prevalence of temples in the countryside make them a natural conduit for the organization’s campaign message. “The monks respect the natural environment, and the people respect the monks. So we need to work with the monks in the temples, people in schools, village offices and shops to reach the maximum number of people for our campaign to be successful,” Serge said.